As part our our Paris Fashion Week project, Starhotels Collection's Parisian location: Castille Paris and I decided to organized a one-night pop up gallery featuring a carefully curated collection of my work, accompanied by a live illustration event for guests and special invitees to enjoy! For more info on the event, click here. 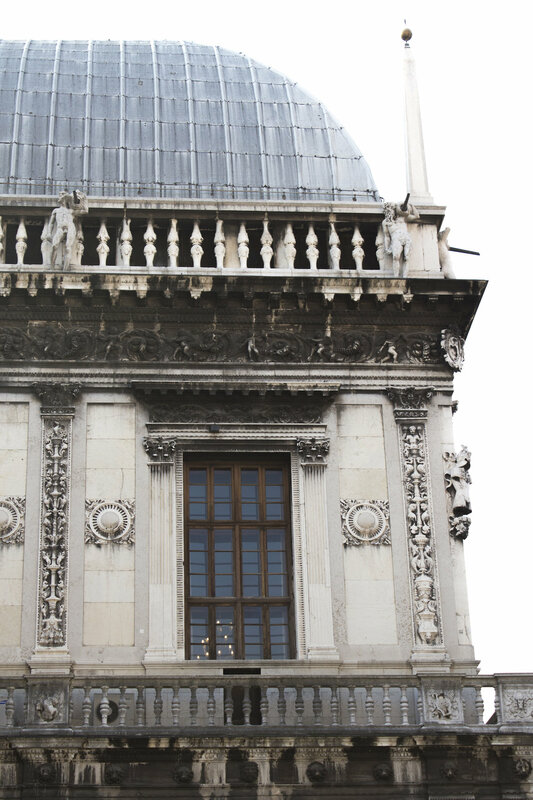 Our experience at Castille Paris was everything we could have wished for and more! Once we arrived at their central location, we were met by the hotel's valet service, who were kind enough to park our car at the nearest parking at Place de la Vendome, as a complimentary service. After a warm welcome from the hotel's front desk and PR team, we were kindly escorted to our room. We were delighted at the news that we had been upgraded to one of their legendary our duplex suites, which was every bit as luxurious as its reputation had informed us. Decorated in the hotel's signature classic style, our five star haven enchanted us with the exquisite details and refined comfort of its generous, luminous spaces. The Duplex Junior Suites span 30 sq.m on two floors, its large lounge downstairs embellished with sumptuous silk and velvet curtains . The comfortable bedroom and elegant bathroom were situated upstairs. After setting up the pop up gallery, at the hotel's L'Assagio bar and the elegant tea room and finishing up our four-hour long event, we were welcomed in our duplex by a bottle of exquisite French champagne, and delicious treats alongside a wonderful handwritten note from Castille Paris' amazing PR team. 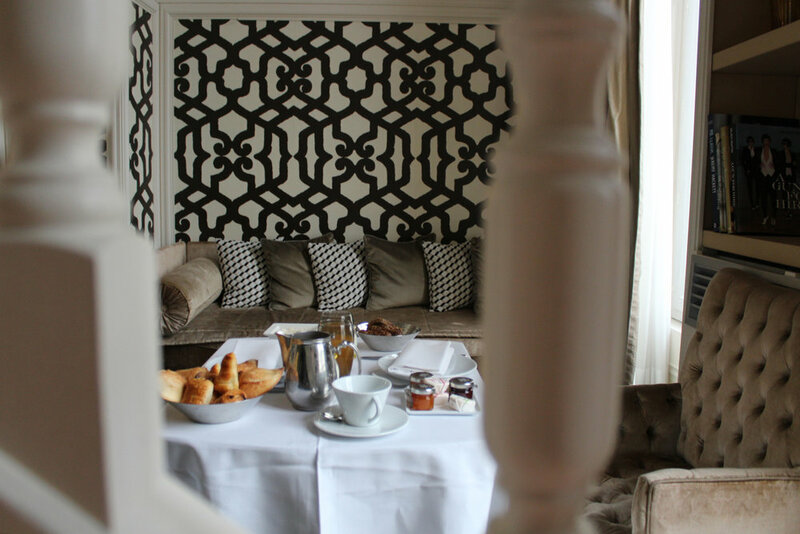 Our 2-day stay at this Parisian gem was topped off by amazing room service, which translated into a delicious breakfast to help start off our daytime adventures. Thank you to the entire Castille Paris team for the absolute wonderful care during our stay, and for making this experience an unforgettable one. For more information on Castille Paris – Starhotels Collezione, feel free to click here. I'm woken up by a ray of sunshine escaping the wooden blinds gracing the east wing of my bedroom. For a moment, I feel disoriented, wondering where I am. 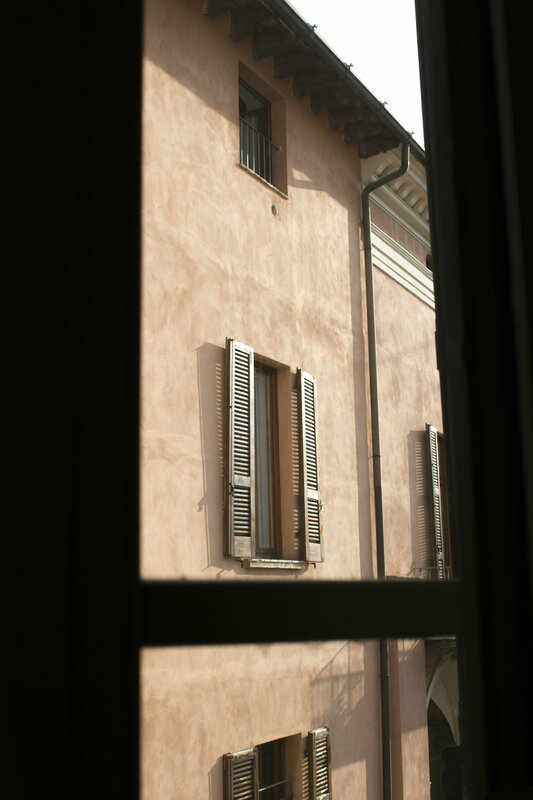 Perhaps because waking up in Palazzo Monti feels like nothing short of a dream. Part of me still can't believe I'm the Palazzo's Artist in Residence during Milan Fashion Week. I soon realize my sunny welcomer isn't the only thing keeping me from my sleep. Voices, high with a touch of celestial, also aid the eager sun in my wake. The choir boys, I laugh to myself. The group of young men next door preparing for priesthood, solemnly singing their morning prayers again. I get up from the warmth of my sheets, and give into the sun's embrace by opening the ceiling-high windows, only to be welcomed by the Palazzo's courtyard. Fellow Artist in Residence, Frederico (a talented graduate from the Royal Academy of Fine Arts in Denmark) is already hard at work, reading and enjoying his morning expresso. A smile instantly floods my face. Still barefoot, I head over to the centuries old door that provides entrance to my chambers, and can't help but pinch myself as I open it. In an instant, I'm swallowed by an ocean of ancient Italian culture, one I would happily drown in. As I look up at the breathtaking frescos, my gaze is answered by a group of cherubs, all of whom - as Edoardo Monti (who's family owns the Palazzo) informed me - have been guarding these walls for over 300 years, after a local artist brought them to life in the mid 1700's. I descend the royal staircase, turn right, and reach Leonardo's (the Palazzo's longest resident so far) studio. I knock. No response. As I enter, Leo's beautiful array of sculptures, paintings and sketches brightens up the already spectacular space - Maria Callas' voice providing the perfect backdrop. In the kitchen, another one of the residents, Heather (a fellow New Yorker), is also getting ready for breakfast. I sit, and continue my morning of art, opera and caffeine by her side. When I'm not busy working in my very own atelier and gallery (provided by the Palazzo as part of the program), or filosofying about art and life over a home-cooked meal with the other creatives, accompanied by (maybe one to many) bottles of Italian wine, we fill the hours with trips to the art store, coffee breaks (and/or aperitivo) at one of the terraces at the Piazza, drinks in the town's hot spots or gelato by midnight stroll in picturesque Brescia, a Lombardic town who's beauty is as authentic as that of the Palazzo itself. So many stories to tell. Too many stories to tell, and I am grateful for every single one of them. My Italian dream, my home away from home, thank you for all the wonderful memories. I will cherish them now and always. Thank you to the Monti family, for believing in my work and for not only opening their Palazzo, but also their lovely home in Bergamo with incredible warmth and hospitality. To my fellow residents for all the late night talks, the morning coffees, the sense of community. And a special thanks to Edoardo Monti, for making all of this happen, who's friendship I will cherish for many years to come. Ciao my loves, until very soon! PS. For pictures of beautiful Brescia, and for more info on the Palazzo and its Artist in Residence program, please check below. 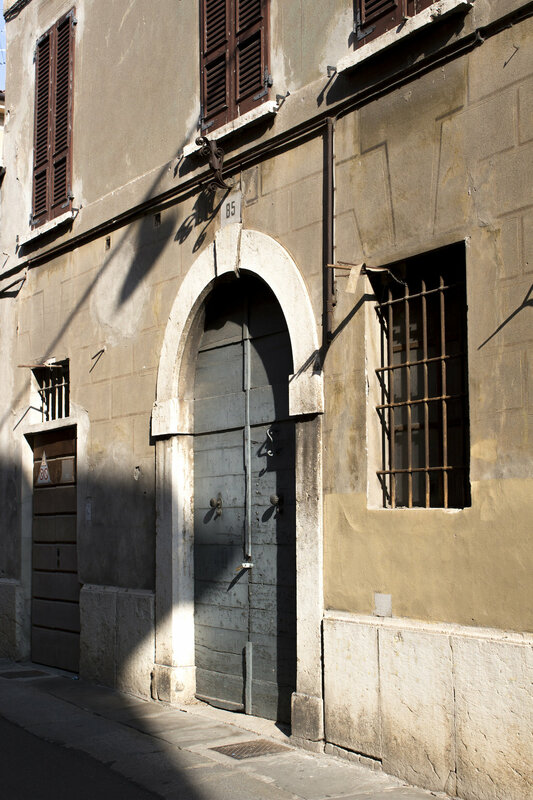 Palazzo Monti, launched in March 2017, is an Artist Residency program located in a centuries old palazzo in the city of Brescia, Italy. The project is completely independent from any institutions and funded by the Monti family. Managed by a team of under-30 art lovers based in NYC, Palazzo Monti has so far hosted 5 artists from Brazil, USA, Denmark and Germany. Frama, a Copenhagen based design company, partnered with Palazzo to provide some furniture, lighting fixtures and kitchenwear. The program is completely free for resident artists, which are selected anonymously by the NY based board. The Palazzo is from the XIII Century (1200) and was built by the Maggi family. It was then bought by Brescia’s Hospital, until the time when the Cazzago family bought it from the Hospital several years after. The alfrescos are from the 1750s, probably when Alfonso Cassago got married with Silva Mazzucchelli, and celebrate their wedding with scenes from the Roman and Greek mythology. In the courtyard there is a well from the early 1500s, and a marble fountain from late 1700s. The Cazzago family sold the house again in the 1850s and since then it has been owned by different families. The Scaroni Monti family owns the house since the 1950s. "Well, I'm screwed,", I think to myself, as I look outside the window of my new studio. Not even a week has passed since I officially quit my 9-to-5 job to become a full-time illustrator, and already I'm panicking. What more could I want? A view on the Hudson river, a brand new studio, more time than I could've ever dreamed of when I was working at my old job... Yet here I am, paintbrush in hand, completely, totally, and utterly terrified. As I stare at the blank paper in front of me, every single bone in my body is screaming, "STOP. You can't do this! Don't waste another piece of paper. What if it doesn't come out right? What if you spend your whole afternoon on something that isn't even worth posting on Instagram? How much did I pay for this paper again? $12,99? So for 30 sheets, that comes out at, how much per sheet? How much is left in my savings account? What if I don't get a new commission this month? Will I be able to pay rent?" As you can imagine, this type of paranoid overthinking is not exactly the best mindset when trying to express yourself creatively. Vois ici the famously dreaded creative block. The good news, however - for all you creative types out there that are feeling as equally hopeless as I was at this point - this happens, has happened, and will continue to happen to almost every single creative person who's had to endure their creative process. And though these moments may feel like they're going to last a lifetime, fear not! They most certainly aren't. All you have to do is snap out of it. More easily said than done, I agree, but not altogether impossible. So what do you do? Though the process differs from person to person, here are a couple of things that have helped me get back into my creative mindset. Try to get away from what frustrates you. Don't want to look at the black canvas anymore? Don't. It's just that easy. Stop obsessing over actually creating something, and focus more on what is going to get you there. In other words, focus more on finding something that inspires you. Whether that is scrolling through your Instagram or Pinterest feed, listening to music that unlocks you, or even watching a movie that gets you in the right mood. See the bigger picture. No, the world is not going to end because you didn't finish that one illustration you had set out to finish tonight. Allow yourself to bend your expectations. This does not mean you can get lazy with the tasks that you set yourself out to complete, but just know that sometimes it's okay to reevaluate your goals when necessary. 3. STOP BEING SO HARD ON YOURSELF. Though setting goals for yourself and sticking to them is extremely important, I also found that setting unrealistic goals actually creates more stress, and ends up doing more bad than good in the long run. This is because when the goals you set for yourself are unrealistically high, you're already setting yourself up to fail from the get-go. So of course you're going to feel demotivated! So what if you don't create your best work 100% of the time? Guess what? It's okay! Try not to see it as a failure, but to see it more as an opportunity to learn from your mistakes. What would I do differently? What can I improve? Also, don't forget that no matter how much you don't like the end result, you've still gained practice, which is a win in itself. Get out of the studio, get out of the city, go on a holiday! Whatever your time and budget allows you to do, do your best to free your mind from whatever is blocking it. Having new experiences and stepping away from what gives you anxiety helps renew your energy and your attitude. As I mentioned before, these are not golden rules for getting out of your creative funk. The process differs from person to person. But feel absolutely free to try them out! I'd love to hear how it goes! So feel free to let me know, or to ask any questions in the comment section below! As always, thank you guys for stopping by!